Nintendo's foremost game designer is not ready to retire just yet, but he believes that his games will live on long after he steps down. A few weeks ago, the internet let out a collective gasp when Shigeru Miyamoto, the renowned creator of franchises like Super Mario and The Legend of Zelda, would be stepping down from developing new games. A day later, it breathed a sigh of relief when Nintendo clarified his statement. Miyamoto may not be ready to quit the big N just yet, but according to a new interview, his retirement may not be that far off. When he leaves, though, he is confident that the series he pioneered will go on just as before. "[To] be clear, I have no intention to retire at all. 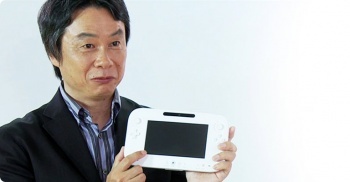 I'm not old enough to think about retirement right now," says Miyamoto. "But everybody has to retire at some point. I wanted to make clear we are preparing for that." As of right now, Miyamoto seems too busy to step down, even if he wanted to. 2011 saw the releases of Mario Kart 7, Super Mario 3D Land, and The Legend of Zelda: Skyward Sword, and Pikmin 3, Luigi's Mansion 2, and a mysterious "original" title are on their way for 2012. Coupled with the prospective late 2012 WiiU launch, Miyamoto's schedule doesn't seem to allow for retirement until at least 2013. "[People's expectations make] me feel some pressure," he admits. "But ... I'm enjoying myself." Miyamoto suggests that he would like to retire someday, though, and that's where the new development teams come in. "The team behind Super Mario 3D Land, were once kids who loved the original. Now they're paying kind of homage to create the latest iteration for today's customers. The cycle is going to remain so that good characters and franchises can just go on forever." Given the praise that the title garnered, Miyamoto is probably right that Nintendo's existing franchises can go on just fine without him at the helm. Whether his company will develop any new ones, though, is a question worth asking. "I become rather jealous," Miyamoto remarks, "because we have to pass away and [the videogame characters] can just go on." Philosophizing aside, Nintendo's most famous creative director seems to have at least a few more titles in him before he retires, presumably to his own private Mushroom Kingdom. Now that fans, investors, and developers know that Miyamoto's departure is an inevitability, what will become of Nintendo and its franchises?